I came across a recipe for the “Best-Ever Vegan Chocolate Cupcakes” and thought “This looks interesting. I wonder what this would taste like”. Vegan diets don’t include any animal products so typical ingredients such as eggs, milk and butter are not included in the recipe. It also just so happens that I had a housewarming party to go to this weekend where the owner is vegan so I figured what a great opportunity to do a vegan vs. non-vegan cupcake taste test? I wonder if people will be able to tell the difference (or which one is vegan or not). I figure they probably will. For this taste test I prepared two types of chocolate cupcakes. One using a regular recipe for chocolate cupcakes (which included eggs, milk and butter) and another recipe for vegan cupcakes (which used soy milk and vegetable oil). I also prepared two types of frosting (the frosting was actually easy to modify since all I had to do was substitute Becel – vegan instead of butter). Wow – cupcakes without eggs, milk or butter? Oh my! 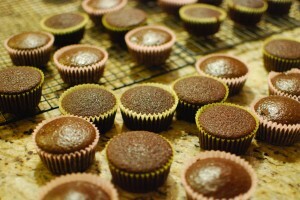 For some reason I think that the vegan cupcakes will come out being a lot more dense or they won’t rise as much. I also think that they might taste oily and take on a bit of the soy milk flavour compared to their regular chocolate cupcake counterpart. Please try each type of cupcake and indicate if you notice any flavour, texture and visual differences between the two. Which one do you think is vegan? Do you like one more than the other or do you think that both cupcakes are equally good? All of the taste testers noticed the color difference. This is due to the fact that I used two completely different recipes where one called for Dutched cocoa (which is darker) vs. non-Dutched cocoa (which is more red in color). I am very surprised that the taste of the soy milk did not come through in the flavour of the vegan cupcakes. The texture was more dense (which I suspected would happen). However, the major difference was in the icing. I made two different types of icing for this taste test as well (regular buttercream icing for the regular cupcakes and a vegan icing (where I used Becel – vegan instead of butter) for the vegan cupcakes. The difference between the two icings was obvious. However, I’m thinking that perhaps by adding less water to the vegan icing, I might be able to make it closer to the texture of the regular one. Anyways, not bad for my first vegan taste test! I can see myself taking this a step further and actually doctoring up recipes and ‘veganizing” them by substituting soy milk instead of regular milk, flax instead of eggs and shortening or vegan margarine instead of butter. Perhaps in a future taste test? We’ll see! It is possible to have vegan baked goods that taste great. They aren’t necessarily going to be more oily but the recipes do require some tweaking in order to make sure that they turn out okay. To see the method used for these cupcakes, please refer to blog post titled “Food Lab: Vegan cupcakes“. I used a vegan-specific recipe that I found rather than making substitutions to a non-vegan recipe. I have to admit, that this recipe was really good. We’ll have to see if I get as good results when making vegan substitutions to regular baking recipes. « Food lab: Vegan cupcakes	» Cheese please – Regular or reduced fat? I’m basing this more on the texture and colour rather than taste. They both taste pleasing and I’m not noticing either the soy milk flavour or oiliness from margarine. “A” reminds me of typical cupcake with a firm texture and frosting. “B”‘s frosting is less stable, making me think the vegetable oil did not set up as well as butter might in a frosting. I’m also wondering if you used beets to replace the eggs in “B”. Is that why they are a bit red? Can’t wait to find out the results! Both are good tasting! Your vegan friend will be satisfied. They both tasted good but they were different. They cake part was different with cupcake B being lighter than cupcake A. B: soft moist but firmer crumb; reddish colour, like red velvet cupcakes. Also stuck to the muffin liner. Icing has a buttery sweet flavour. I will say that I am surprised with the vegan. They are definitely acceptable in my books, there is a hint of soy flavour but really, it’s not noticeable on the whole, with the icing. All in all, I still prefer the taste (and texture) that milk, eggs and butter provide. I had no interest in tasting a vegan cupcake, but I think both were actually pretty good. A: This was my favourite and I think it is the animal cupcake. It definitely looked more chocolatey. It was most and I think slightly sweeter than cupcake B. B: The colour of this cupcake has a reddish tinge which makes me think it is the vegan cupcake. It also tastes a bit “carroty” or is that my imagination? Either way, I was impressed that the vegan cupcake was not gross. Wow! These are both really good. There is a color difference because one recipe called for Dutch processed cocoa and the other one called for regular cocoa. 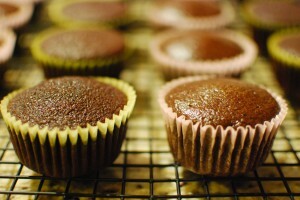 Cupcake A: Darker color (because of the cocoa), not as dense and the icing is more thick. I prefer the icing on cupcake A more due to the texture difference. Cupcake B: Slightly denser and the icing is thinner. But it still tastes good. I’d have to say that both cupcakes taste equally good. But there are definite texture differences between cupcake A and cupcake B (in terms of the actual cupcake and the icing). For this reason, if I had to choose one over the other, I would choose cupcake A. However, both are acceptable. – the top isn’t as peaked or shiny, so not as appealing as B. -I thought from visual cues, that this was the vegan one because it was more flat, appeared not to have risen as much. -but as soon as I sunk my teeth in, my opinion changed and I realized it must be the non-vegan. – much fluffier, melts in your mouth more. B was not terrible, but just not as good. My preference is for A. The cupcake A had a richer dark chocolate colour, lighter texture and was more moist. B had a dense texture and a reddish chocolate colour which I found interesting. If someone served me cupcake B I would think it was dry or stale. Icing on A – seems to have a thicker consistency especially at room temp. Icing on cupcake B seems to be oily and separated at room temp. Thanks Lisa – good taste test. Cupcake A – Tastes like what chocoholics refer to as “that chocolate cake”. Very moist, great chocolate flavor. It also pulls nicely away from the wrapper, sign of richness. Cupcake B – Has a nice chocolate flavor, but the texture is very dry. It doesn’t feel as decadent as A.